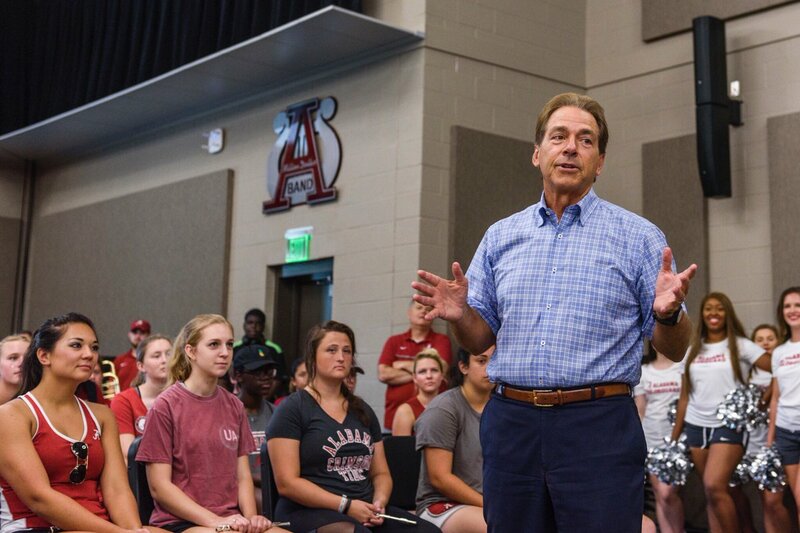 With the season approaching next weekend and band camps in full swing, football coaches are taking time out of their days to stop and recognize the importance of their bands. Earlier this summer Dan Mullen from Mississippi State came to the rescue of the band due to heavy downpours that swamped their practice field. He offered them the football practice facility and altered their football camp schedule to accommodate them. You can read about that HERE. James Franklin from Penn State invited the band to come in and invade a team meeting to teach them the fight songs and Alma Mater. Check it out HERE. And now many more coaches are showing some love as well, including the top coach in the business, Nick Saban. Jacksonville State University football coach John Grass brought the entire team to see the band practice and catch a run through of the first part of their halftime show. They then had a pizza party together. Grass also addressed the band. The SMU Band went over to football practice the other night for a surprise visit only to be surprised right back by the football team who brought a boat load of Powerade to hydrate the band during one of their evening rehearsals. At Nevada, Coach Jay Norvell, actually came to welcome their new band director on his first day. Super cool. There are so many more coaches who have stopped by the bands this summer and we want them to know how much we appreciate their support. So make sure you say thanks and encourage this type of interaction. There should never be a wall between the band and the team. That's why we always use #OneTeam to highlight these interactions on twitter because we truly are one team. Download episode 3 of our podcast "Across The 50" today! !